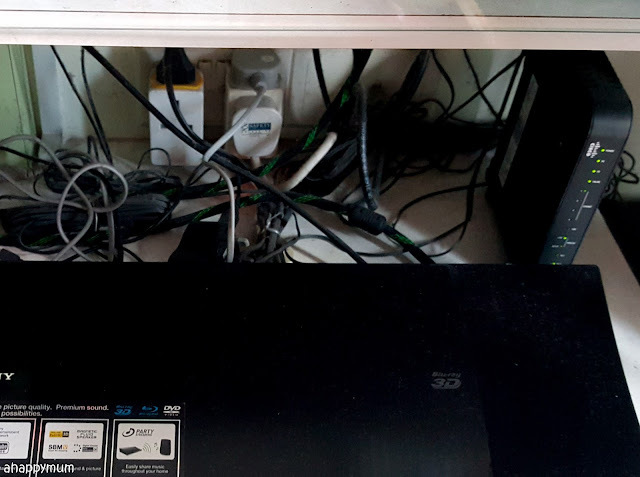 When it comes to the home, there's something that really irks me and that is.... messy wires. 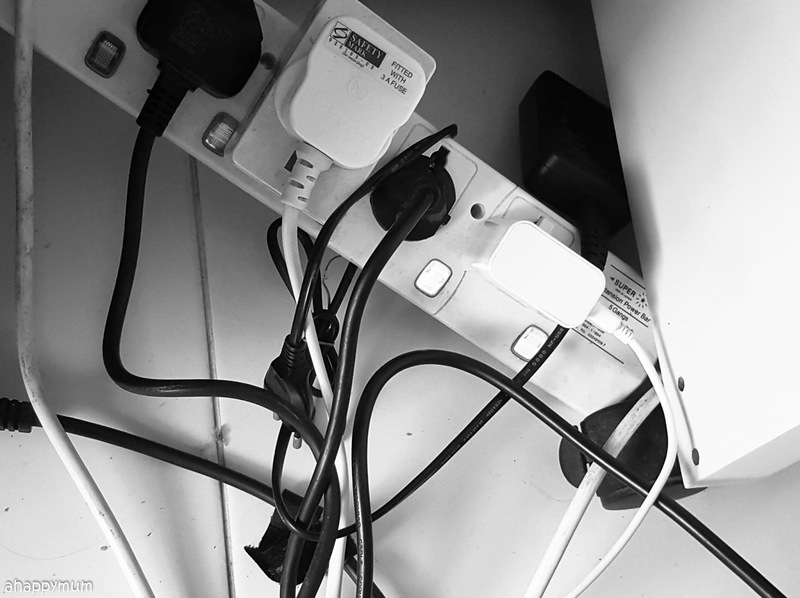 Yup, an entanglement of power cables somehow puts me off and yet, I've lived with it for many years because there just didn't seem to be another way out in our previous houses, or we assumed so and thus continued to procrastinate. See what I mean by a mess of wires? Yup, this mess at my last computer desk was actually one of the 'better' ones. Now, check out the previous mess at the TV cabinet. Oh gosh, right? That is just plain unsightly. Besides the fact that it's terrible to look at and that this spot accumulates dust faster than I can clean, what really troubled me was how the whole thing posed as a electrical hazard and while I knew I wouldn't be so silly as to fool around with the cables, I just couldn't say the same for my kids. I mean, getting bruises and cuts are considered part of growing up, but risks of fire and electrical shocks are a big no-no. 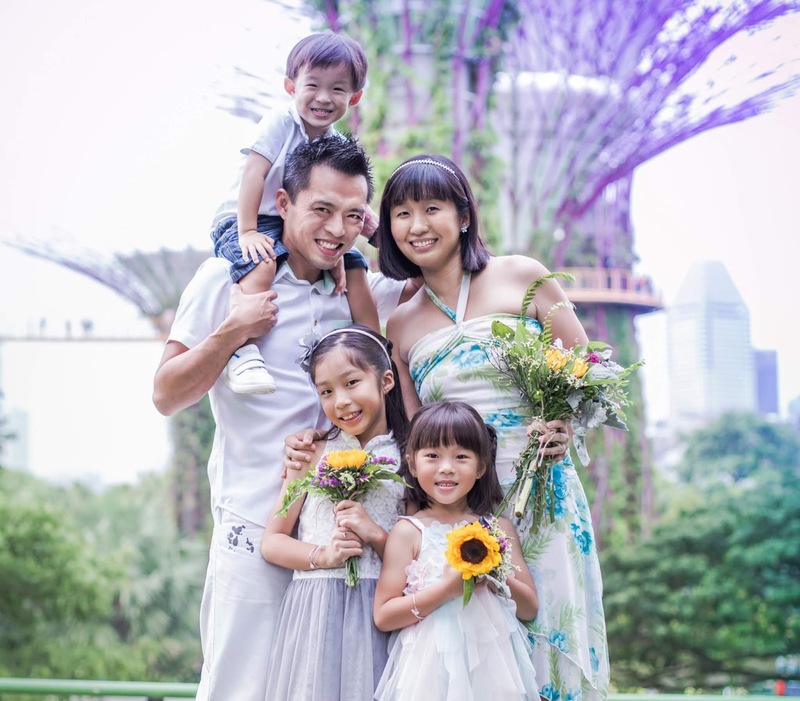 And when it comes to being a mum, we just wish to keep our kids out of harm's way, right? So one of my utmost priorities in moving to the new house was to get rid of messy wires. You bet I was pretty resolute about it and I put in much of my time and effort in planning how to set up the cables and resolve this issue once and for all. With the toddler who is now getting very active and walks around the house to explore all the hidden corners, this made it even more important for me to get everything set up properly from the very beginning. 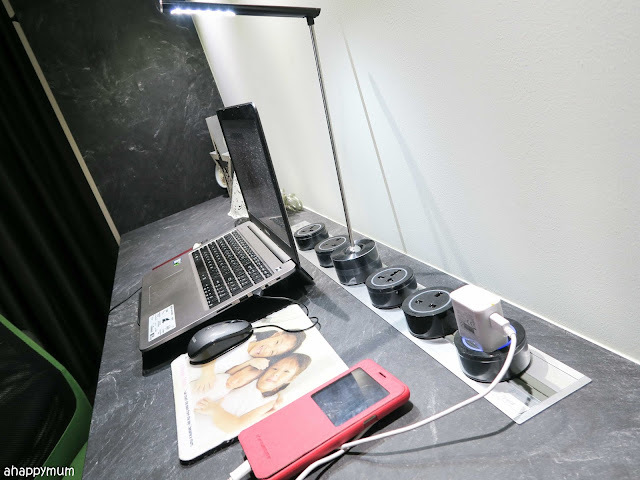 I still remember the first time I read about Eubiq and its unique power outlet system, and I went "Woah! So sleek and high-tech. This can probably only happen in my dreams." 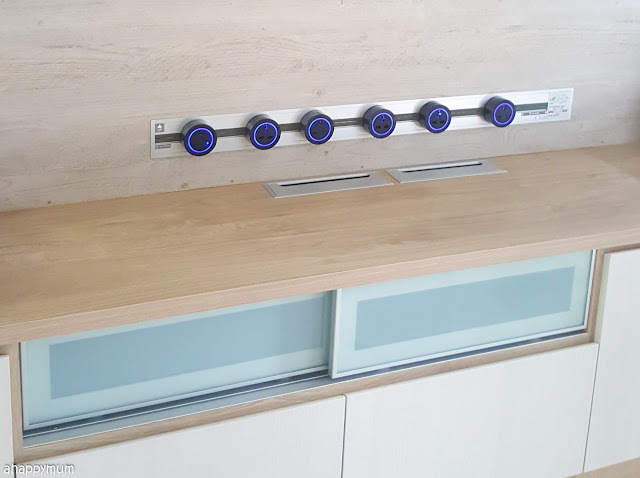 It's cliché but true, I didn't think that I would one day be able to have them installed in my own house and now that I do, I can only say that they are one of the best inventions I've ever come across. Let me tell you more. 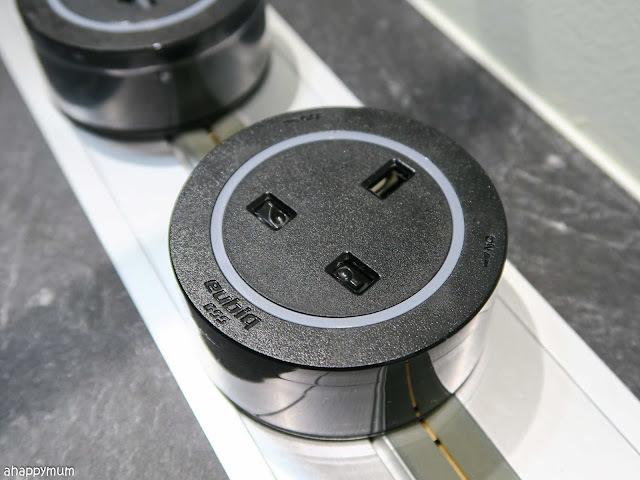 With a vision of becoming the world leader in the new generation of power outlet system, Eubiq was founded in 2000. 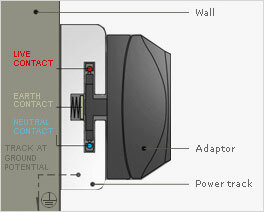 It invented and patented the first-of-its-kind GSS (Grounded Sentry Shutter) system - which makes use of a unique track capable system to add, remove and reposition power outlets- with just a simple twist. See how easy it now becomes to turn on and off the power? All you have to do is turn the adaptor clockwise and the blue light comes on, indicating that the power is on. To shift the position of the adaptor, all you have to do is twist it a little more, plug out and then insert it somewhere else along the track. Easy peasy, right? 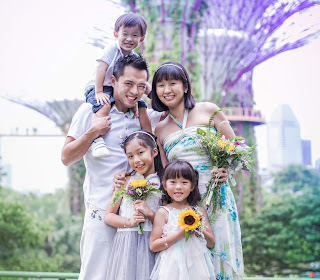 Well, I totally love how Eubiq helps to power up our house and here's sharing the five main reasons why. I don't think I have to explain this, right? 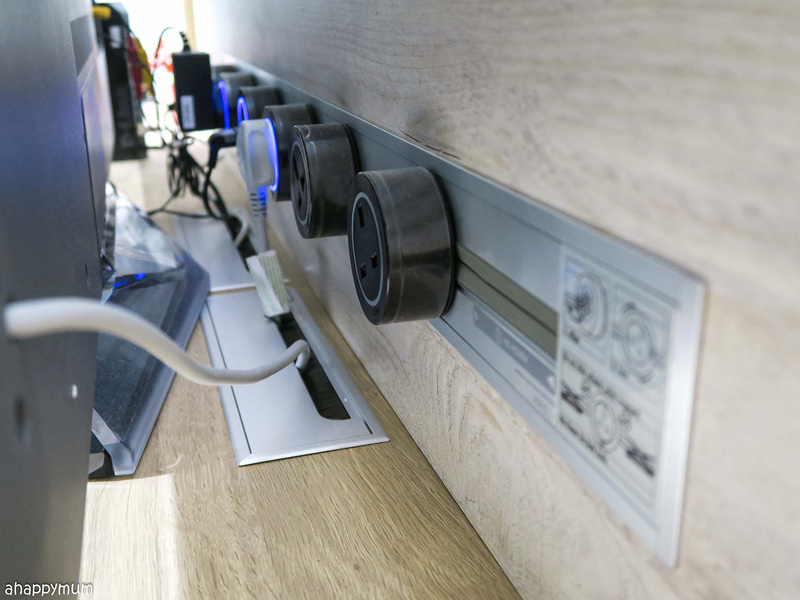 I mean, seriously, how much nicer does this look than the usual white, boring-looking extension sockets? 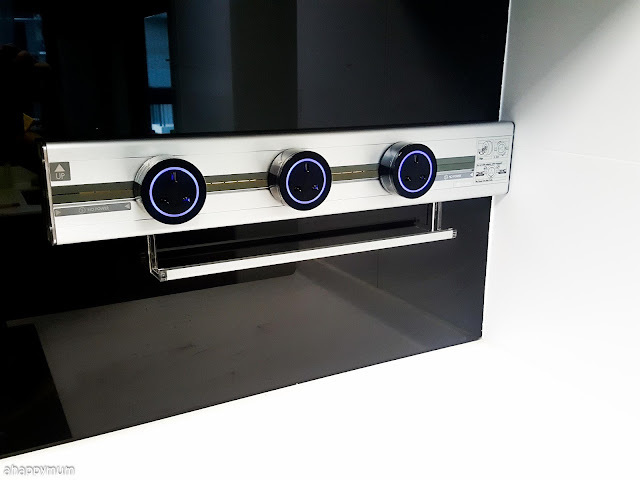 We installed the aluminium tracks and black adaptors in our house and it's easy to see how they instantly made everything look more elegant and sophisticated while keeping it minimalistic. I chose to go for the recessed mount tracks - which means they are sort of embedded into the furniture - which took up a good deal of planning and liaising on my part between the carpenter (who had to cut a hole of the right dimensions), the electrician (who had to pull an electric point) and the technicians from Eubiq (who installed and fixed the tracks). Yup, that is what happens when you decide to be your own interior designer. 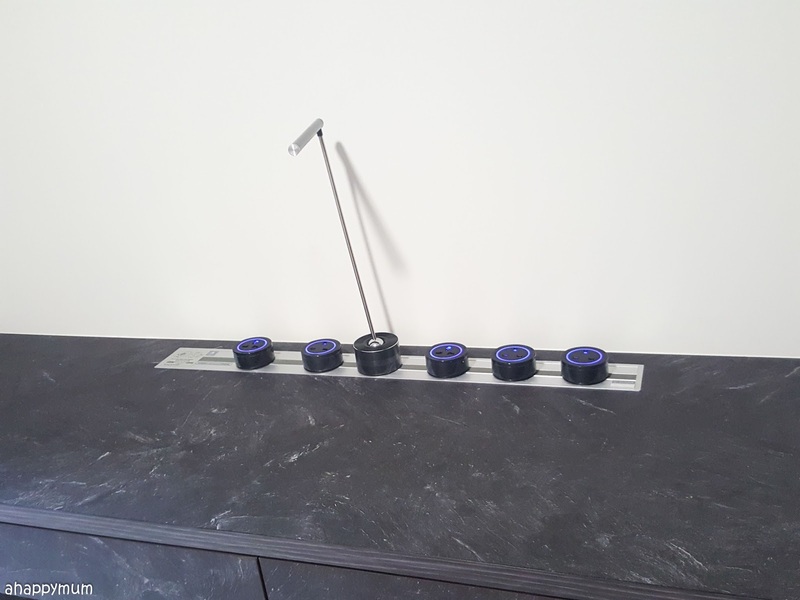 Anyway, you can also opt for the surface mount tracks which will be fixed over your furniture or walls and are more straightforward to install. See below for example. Making use of Eubiq tracks gives you flexibility since it is so easy to remove and reposition the adaptors - in other words, Plug and Play. We have a total of 20 adaptors to share among the power tracks in the house and you can divide them according to your needs and preferences. Some tracks can be filled up while others more sparse, but the great thing is whenever you need an extra adaptor, you can swiftly remove it from another track and plug it in without any hassle. The GSS System is a patented safety feature found in all power tracks and it effectively grounds all conductive objects that come into contact, making it virtually impossible for any hazardous shock. What this means for us parents is that even if your kids were to be curious and poke their little fingers into the tracks, they will not get an electric shock because the live contact is not connected to the earth contact. The points will only be connected when you plug in the specially designed Eubiq adaptors and twist them to turn on the power. This does mean your kids should not be poking sharp objects into them when the blue light comes on, yeah? You can choose from a range of Eubiq accessories which will be compatible with the power tracks - including task light, appliance adaptors, lamps, USB adaptors and so on. 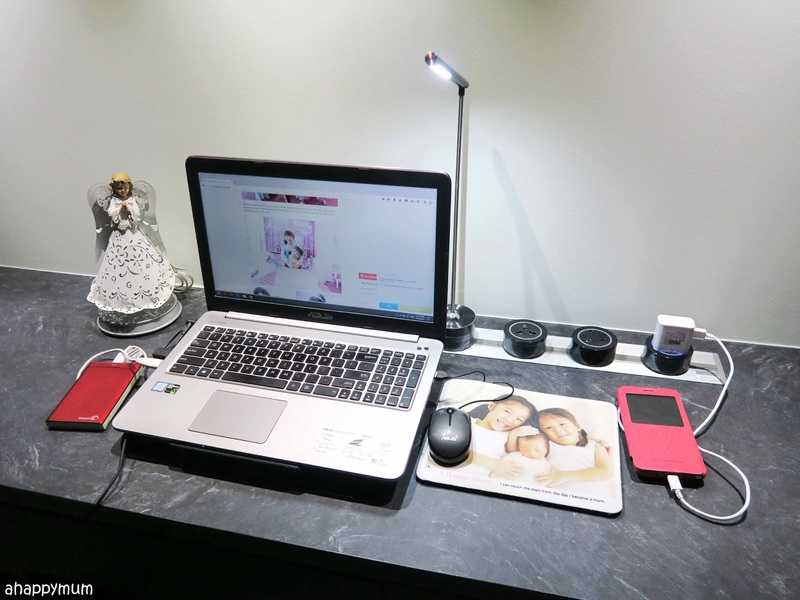 I'm loving the task light because it provides just enough light for me to blog at night without making it too bright for the sleeping baby. And how easy can it get to turn on this light? Just turn the base! Before you get me wrong, I'm not saying that Eubiq helps to get rid of wires totally because the fact remains that you still need to plug your electrical appliances into the adaptors and the wires will still show. However, what it does help is to keep them at bay and reduce the mess, if not eliminate it. The fact that you can shift, remove or add adaptors is a huge bonus on how you can make sure that the wires do not tangle and are kept as neat as possible. Here's a quick view of how our house looks like now, thanks to Eubiq. The above shows the 60-cm track in the kitchen. I love how you can add railings and hooks below the track which come in pretty handy for hanging up kitchen cloths and mugs. The wires to the appliances are still there, but I've managed to tie and tuck them nicely such that they aren't easily seen. Here's the 80-cm track in the master bedroom. It is the recessed mount type and fits nicely into the table at my workstation. Yup, it's now much easier for us to charge our phones and cameras without having to fight for empty sockets. What's more, I don't have to bend over to look for the cumbersome extension socket (which is usually placed on the floor) or fumble to find the individual switches because guess what, all I need to do is plug and twist. Lastly, here's how our TV feature wall looks like with the 1-metre power track. Finally, messy wires are concealed! What a huge difference as compared to our previous house, right? I am showing you how it looks like behind the TV so you can see that the wires are still there but they are nicely hidden behind the TV, which currently sits on a stand. 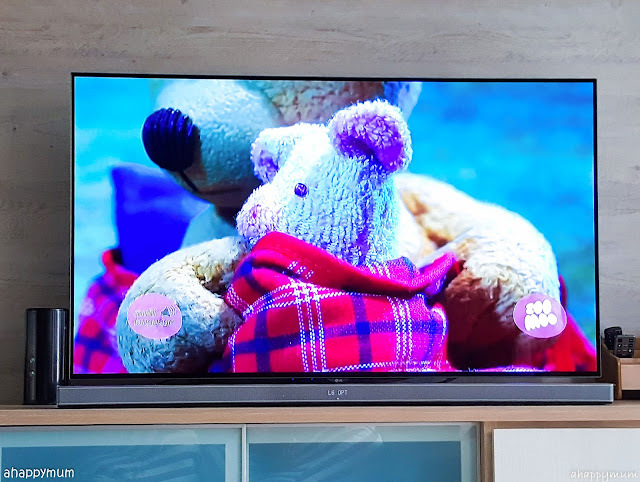 If you were to mount the TV onto the wall instead, you will be able to see the power track in full view but that will also mean that some of the wires - the parts that emerge from the grommet - will show, which is not what I want for now. Having this considerably long power track right behind the TV makes it easy for me to connect the electrical appliances (we have more than half a dozen here!) and switch them on/off whenever I need to at the snap of my fingers. 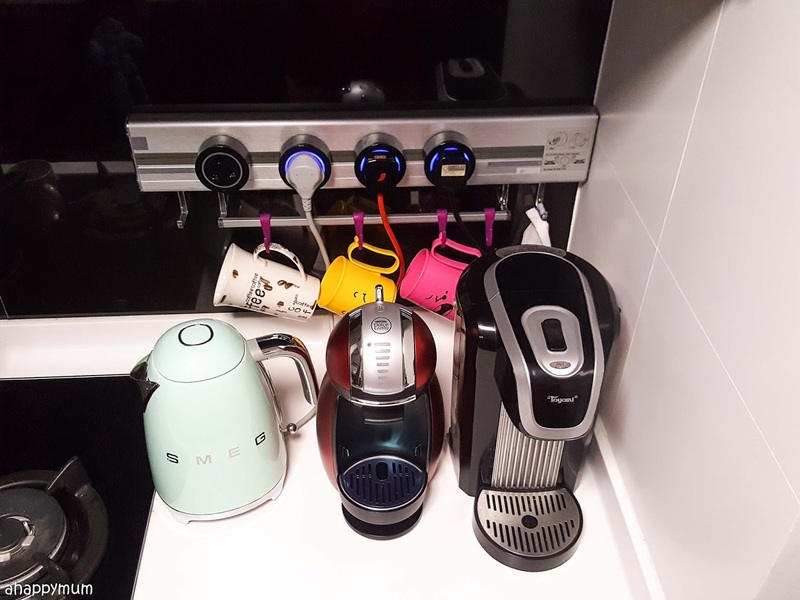 Yes, I am totally in love with our sleek looking Eubiq power outlets, I'm thankful for them being ultra-flexible and child-friendly, and I greatly appreciate how they help to keep power cables in place and the house looking nice and neat. Disclosure: This is a sponsored review. The power tracks, adaptors and accessories we received are all kindly sponsored by Eubiq. All opinions are our own.